When you train on holiday or whilst travelling, generally you don't have much time or access to equipment. The solution is to get creative and refocus on intensity. These 7 WODs will ensure your fitness doesn't suffer, and neither does your holiday. It can be quite funny to see the look on people’s faces when they hear that you train whilst on holiday. ‘Why would you want to do that?’ is often a reply, or ‘Are you mad, you’re on holiday!’ can be another. The thing is, as Crossfitters, fitness is part of our lifestyle and going to the Box no longer represents getting into shape for the first couple of days abroad only to sink 15 beers, 3 lunches and a heavy dose of cocktails before looking in the mirror and wondering why you even bothered in the first place. You shouldn’t feel as though it is unusual to do holiday wods whilst away, if hitting some hill sprints before going to the beach makes you feel good then go for it. Then, just go and enjoy that ice cream. The problem that many people will encounter whilst travelling is that whilst Crossfit and functional fitness style Boxes are becoming more and more popular, finding one whilst travelling around the world can still be challenging. Even when you do, chances are that it will take up time to travel there, train and come back, which isn’t ideal whilst away. Who needs a BOX when you have a beach instead? Immediately after: Sprint at the highest incline and the fastest speed you can handle for 2 minutes. Increase the speed as you go, by 1:40 you should feel purely smoked in your legs…..then push through it! Note: Little tribute to the 2008 Games. This one had to be short and dirty. A little blend of Fran, Squat Clean (thruster) and the Burpee DL workout….can’t forget the run though. Note: Go hard, don’t just go through the motions. This should be doable to complete for most people. Note: I set the treadmill to a 7:20 mile pace and left it running. I would jump off, hit the cleans and brupees and try and jump right back on without a break. Try and find a treadmill that doesn’t turn off if it doesn’t sense a person on it. Note: Go fast and intense. Don’t eat clam chowder right before it like I had the first time I did it. Notes: Hit this hard, don’t just go through the motions. 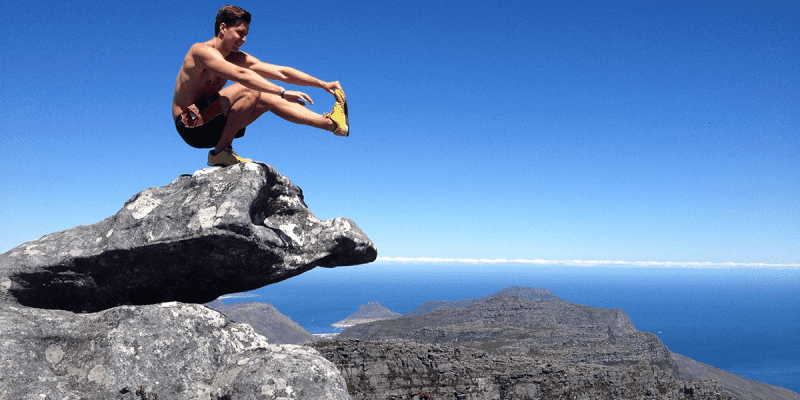 Finish hard on the jumping squats, things will get a bit spicy….enjoy it. These are pretty devastating workouts and requires the most basic of facilities to do so. In addition, who remembers 7 minutes of burpees from the open? That was one movement that was pretty disgusting and provided you go hard enough on any workout with even the most basic equipment you will get a good workout. Aiming for 20+ rounds of that will give anyone a good workout. Going back to the time aspect, if you’re honest, the last thing you want to do is miss out on exploring a new country because you are training for hours every day. One of the fundamental aspects of why Crossfit and functional training works is the foundation it has within intensity. As mentioned above, this is a theme in the Khalipa workouts, go hard. Day to day it is easy to get caught up in the volume trap and squeeze more and more into your training sessions. However, when on holiday, simply remind yourself that if you priortise intensity over everything else you will get results. The below is a quick but effective workout I’ve experimented with whilst away. Provided the weight of the above is scaled correctly it will take around 10-15 minutes, and done with enough intensity will leave you on the floor. I found that you can maintain a high level of fitness within 30 minutes provided the exercises chosen are hit with enough intensity, when returning home, it will be a present surprise with just how much fitness has been maintained and the lower volume/increased rest can even leave the body feeling better than pre-holiday. So whilst there are often facilities available outside of the hotel sometimes it simply isn’t practical to spend every day going to them, therefore picking your movements sensibly and going hard can give you some great results in a short space of time. Holiday WODs don’t have to be a chore, keep them simple, don’t worry about not having the best of facilities and go hard. This will give you great results and peace of mind when you’re browsing that desert menu.